Information graphics or infographics are visual representations of information, data or knowledge. These graphics are used where complex information needs to be explained quickly and clearly, such as in signs, maps, journalism, technical writing, and education. 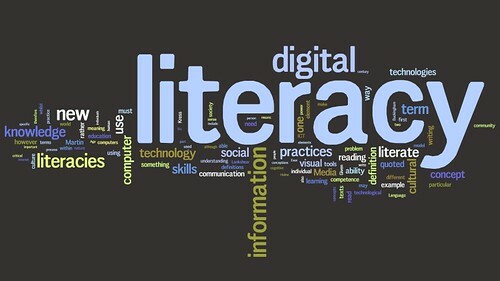 They are also used extensively as tools by computer scientists, mathematicians, and statisticians to ease the process of developing and communicating conceptual information. Finally, programs such as OpenOffice, Powerpoint and Keynote can be used to create infographics. 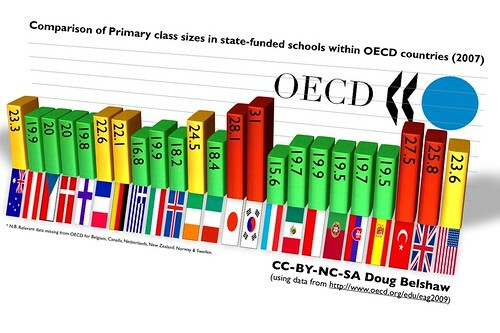 I created the following in Keynote as a practice – it shows average Primary classroom sizes across OECD countries. It took me a couple of hours – the most fiddly part is aligning everything! Next My first infographic competition. Also the delicate balance between clarity of data and aesthetics of the image is difficult to achieve and it is essential that clarity of the data is always paramount. greater potential to mislead if not used carefully! Good job here Doug. There is an ABSOLUTE niche in creating this sort of thing to represent student achievement. 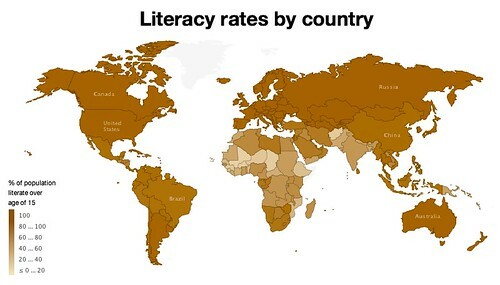 I have spent much of this year trying to convince Excel to produce the representation I want of literacy and numeracy data we collect in our school. If you, or anyone you know can help please let me know! The power of well presented data cannot be overemphasised I believe. Graeme Coslett has provided a solution for me that is ALMOST there and I believe from him what is needed is knowledge of visual basic programming in Excel? Excel thinks too much and is over-predicting what we are trying to achieve and thereby destroying the readibility and subsequent usefulness. I shall look into various systems, however – there’s got to be one that does what you want to do! Interesting post…. moving over to infographics in your career (did I read that right) would be a massive change! It is a facinating area although to be successful in it is quite tough. One of the things missing from your post is the importance of being creative and original – something which programs such as OpenOffice, Powerpoint and Keynote aren’t going to give you. I’d recommend the opensource vector program Inkscape to allow you to create your own images rather than using commonly used functions or images. I’d also recommend (if u have the $$ Photoshop and InDesign) although Gimp will is great for photo manipulation and free. Um, hope this helps. I love infographics and I love teaching design – really recommend Inkscape, Good Luck! Soz, don’t want you to think that your graph was weak – was pretty good – nice n clear. Wordles are nice but it’s always good to try n be original with your ideas – unique, hand done ideas in infographics where the graphic reflects the info (often in an abstract, subtle manner) always win the day rather than getting a program to do it for you (imo). Altho it does depend how much time u want to spend on it! Oh good, glad you thought it was OK. I suppose I have to start *somewhere*! it’s nice to read about your interest in the field of Infographics and thanks for mention as a source of inspiration. Let me know if I can help you out with anything.